Stinking Thinking is going to be one of those difficult things for me to purge this year. I really believe though that this is one of the ways to happiness for me. I am the Queen of Stinking Thinking. I realized this morning that Tuesdays are rough. I start the day early and it ends late. I do alot of driving for work and sometimes it’s soothing but mostly I’m just running late. Today’s goals are to continue working on my happiness list but I’m also going to think about ways to look at Tuesdays in a more positive light. What positives can be found for my late night Tuesdays? Yesterday I worked on a list of activities that make me happy and came up with 15 plus a bonus activity! Today I’m going to work on a list of things that make me happy. I have one for my list already – those little Lindor white chocolate truffles. Also on the To-Do is 15 minutes in the current zone. Another thing that makes me happy is finding the right book to fit a current need. 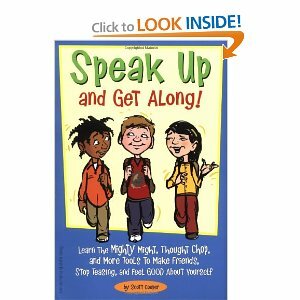 I started reading Speak Up and Get Along! by Scott Cooper. I’ve been trying to help my daughter become more assertive and for her to insist on being treated with respect. I went to Amazon.com to find a few books to help us with this and so far this book is fantastic. I’m reading through the first section of the book which teaches how to express yourself. This one is huge for both my daughter and myself.